Home advice	Ask Shelly: Will Southwest Airlines let me use the Baby B’Air vest for my lap child? Ask Shelly: Will Southwest Airlines let me use the Baby B’Air vest for my lap child? One of the many times we’ve used the Baby B’Air flight safety vest to help protect against turbulence during a flight. First, thank you so much for your informative blog. It’s been a godsend so far in preparing to travel long haul with our 11 month old! Thanks to your blog I’ve discovered the BabyB’Air and have ordered one. We plan to use this during our long haul flight from Australia to New Zealand and then on to Los Angeles (and back again!) as well as the US internal flights with Southwest. On the Southwest website it reads that no belts such as this are allowed to be used on the flight – can you tell me if this is the current ruling from the FAA, or am I within my rights to use it during the cruising portion of the flight? I am hoping to print off advice from somewhere to show any flight staff who might question our use of it. In Australia all flights require a baby lap belt, which seems common sense to me. It’s scary US airlines don’t have the same rules! Hoping for any advice you can give. I have used the Baby B’Air flight safety vest with my own lap-held babies on Southwest Airlines flights to help protect against turbulence during cruise segments, and based on my experiences and that of numerous other parents I’ve heard from, the odds of you encountering difficulty “exercising your right” to use this during the cruise portion of your flight are slim. In the unlikely event that you encounter a flight attendant who is confused about the issue, you can refer to the label on your Baby B’Air flight safety vest which explains that the FAA has not approved it for use during takeoff and landing, but that it can be used during cruising segments, or show the information card that comes with your vest. The decision to ban traditional “belly belts” in the U.S.—and the confusion that still occasionally comes from that—began with a particularly gruesome crash landing where many lap-held infants wearing these restraints were killed, and further studies showed that infants strapped only by their waists directly to the adult’s safety belt could be crushed by the adult’s body folding forward, especially where the adult and lap child were not able to be properly braced (as illustrated in that safety brochure in the seat pocket in front of you) for the emergency landing. While the FAA does not want your lap child affixed to your seatbelt during ground motion, takeoff, or landing for these reasons, most airline personnel are aware that your chances of encountering turbulence on a flight are far greater than experiencing a crash or emergency landing. Turbulence, the leading cause of injuries on flights, is a particularly serious risk for infants and toddlers riding unsecured on laps. One thing I would like to point out about the Baby B’Air is that it’s designed to allow for some flexibility in positioning such that the lap child can lie sideways across the adult’s lap, which is especially helpful for breastfeeding in flight—something many babies will be doing on airplanes whether they have paid seats or not. Not all belly belts allow for this positioning and perhaps that’s part of the problem with wearing them in crash landings, though no testing has been done on this to my knowledge.Before any landing, emergency or otherwise, the Baby B’Air can be detached from the adult safety belt in 2 seconds or less. 17. PASSENGER USE OF NON-APPROVED CRSs ON AN AIRCRAFT. a. Regulations. The regulations contained in § 121.311 prohibit the use of certain types of CRSs during ground movement, takeoff, and landing. However, during the cruise portion of the flight, there is no regulatory prohibition regarding the use of any type of child restraint, including those prohibited from use during ground movement, takeoff, and landing. However, 17 b. follows with the operator’s right to ultimately trump the parent’s right. b. Operational Flexibility. Also, there is no regulatory requirement that an aircraft operator permit the use of “non-approved” CRSs during the cruise portion of the flight. If an aircraft operator decides to implement a policy to prohibit the use of non-approved CRSs in-flight, they have the operational flexibility to do so. The FAA has banned the use on board aircraft of certain types of CRSs that may be harmful to a child in the event of an aviation emergency. These include backless booster seats, safety belt extensions (commonly referred to as “belly belts”), and vest or harness devices that attach to an adult. Although some that were manufactured before the FAA’s ban may carry an insignia and/or language indicating they are approved for aircraft use, please understand that they are no longer permitted. 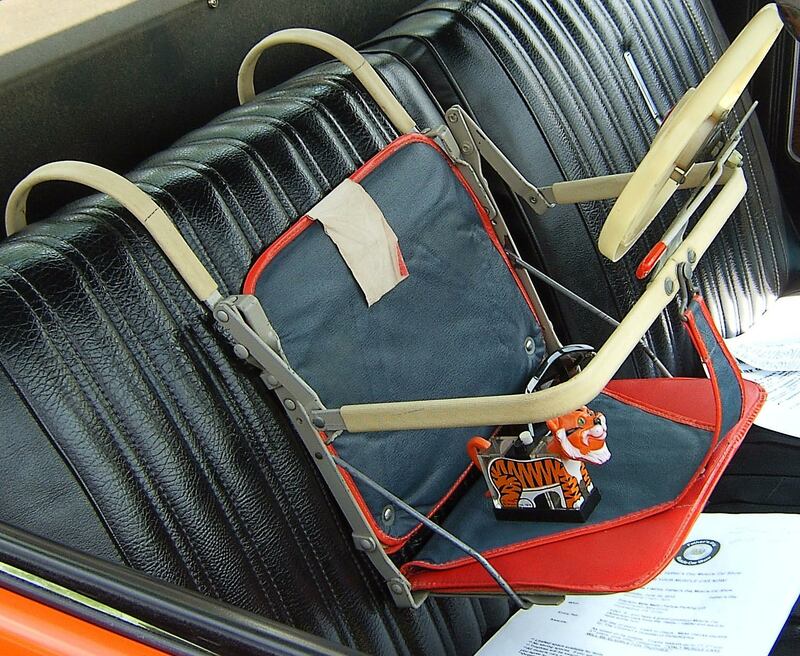 In case you aren’t familiar with 1960s-era car seats, this should give you some idea of what we’re talking about (thank you Love’s Photo Album for this image). Yep, I’d like to see the test data on how this baby performs in a crash landing. Read more about the Baby B’Air and find out where to purchase it in Car Seat Alternatives. Have you used a Baby B’Air flight safety or a belly belt for your lap-held infant–on US airlines or foreign carriers? How did your flight attendants respond or assist with your safety concerns? Glad to help, Liz. Also a couple of comments on the facebook page that might be of interest. http://www.facebook.com/pages/Travels-with-Baby/241586715074 Good luck! Thanks Shelly! As a teacher (and a mum) I think I have a thirst for knowledge so this has helped immensely. I really appreciate the time you've taken to write such a comprehensive reply. Will let you know how the flights go. Wish me luck!